Hello! So I am pretty excited about todays blog post because its something a bit different than we have done lately. 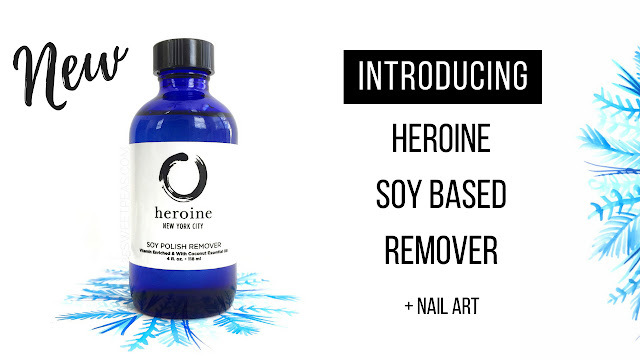 :) Heroine NYC has just released a Soy Based Nail Polish Remover and I have all of the details and even a video showing you in action compared to a normal remover so lets to all the fun! Now below I will kind of share my notes on the use of the remover but if you want to see in action you can in todays Youtube Video. 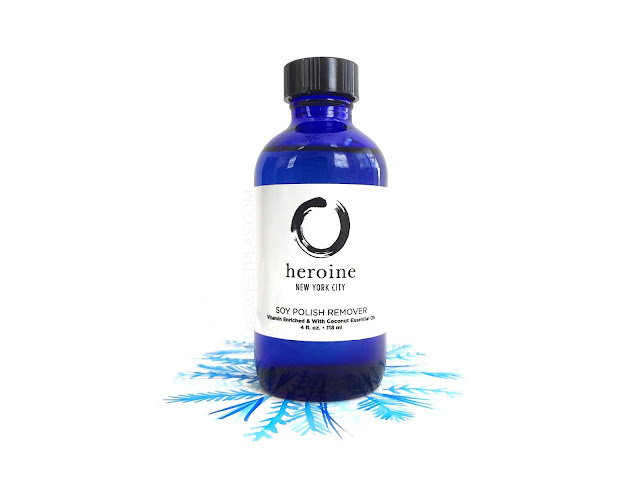 My Experience : So for this remover you use it as you would any other remover. I always use cotton balls when removing and I did that here. It tints the cotton ball a lil yellow which is nice because you can estimate how much you used! ;) Then you use as normal. As you will see in the video I actually show you this taking the polish off of 2 nails and then using normal polish remover on the other two nails and really, they both were really close time wise. The Heroine one might have take a lil more time to start but once it started to work it went fast. *Note I did have 2 coats of top coat so that would have increased the normal time. The main difference is the fact that this Soy based one leaves you hydrated with slightly oiled nails. Meaning it looks like you have just put on cuticle oil. So I rubbed it in and it seemed to make my fingers feel all nice. Overall I feel like it was a win, and a nice alternative if you can't use normal remover or acetone. Here is a peek at some new art! Actually guess what?! The art is in todays video! I wanted to kind of show you the full process. 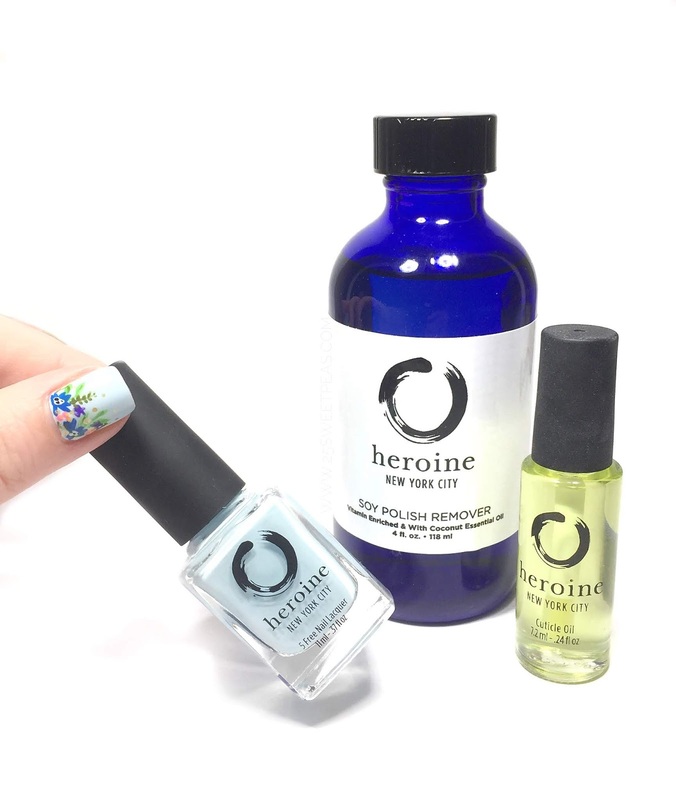 So I start off the video using the cuticle oil (pictured above) then I move on to base coat and then show you a floral nail art look. Then a day goes by and we then use the new remover and compare it to a normal vitamin enriched nail strengthening remover that I normally use. It allows you to see thing with a kind of "full circle" mentality which I think it helpful for this type of post. 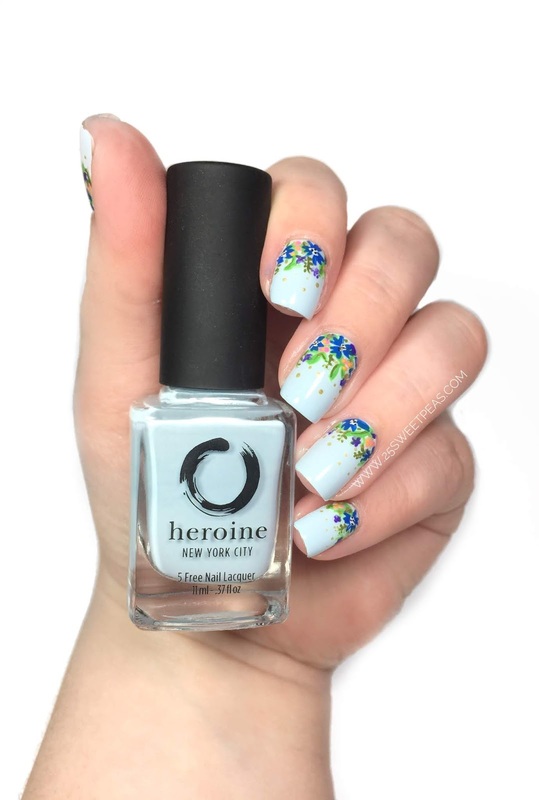 Polish wise I started with Heroine NYC Peek-a-Blue which is a great creamy light blue that has a dreamy formula. Then on top of that I used various acrylic paints and my Mitty Candy 00 brush and my smaller dotting tool. It was one of the florals that I did with no real plan and I just made it up as I went which I think came out pretty decent! What do you think? Well guys that is a wrap! 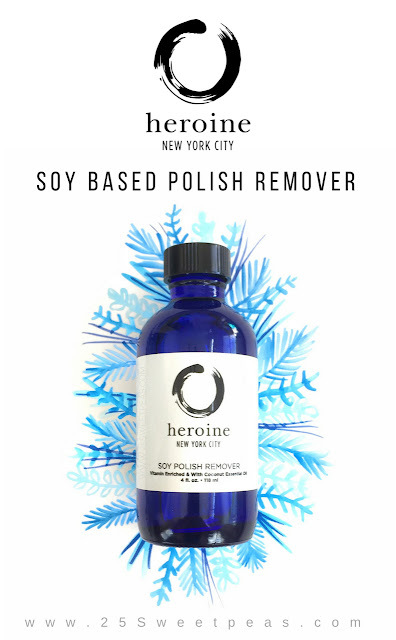 I hope you have enjoyed this post and enjoyed learning about Heroine's NYC Soy Based Polish Remover. I think having an alternative is always nice. Acetone can be really harsh so have something you can use in place when you feel like you need to step away from the acetone is always good. Have you used a soy based remover before? Did you like it, or do you want to try it sometime? 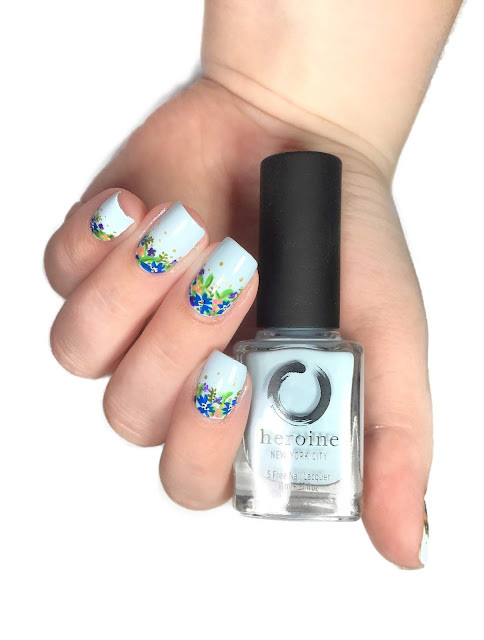 I am super loving that nail art! This sounds like a great alternative to acetone. I know so many that dont like using acetone. beautiful nail art! I'm way too impatient for anything else but 100% acetone...that and I can get a gallon of acetone from my local nail supply for $10. I don’t see a price listed. That’s really important when it comes to products for me. It sounds like a great alternative. I sometimes worry about how harsh acetone is on my skin and nails. Okay so that sounds awesome! It doesn't smell AND it leaves your nails hydrated? That's great! 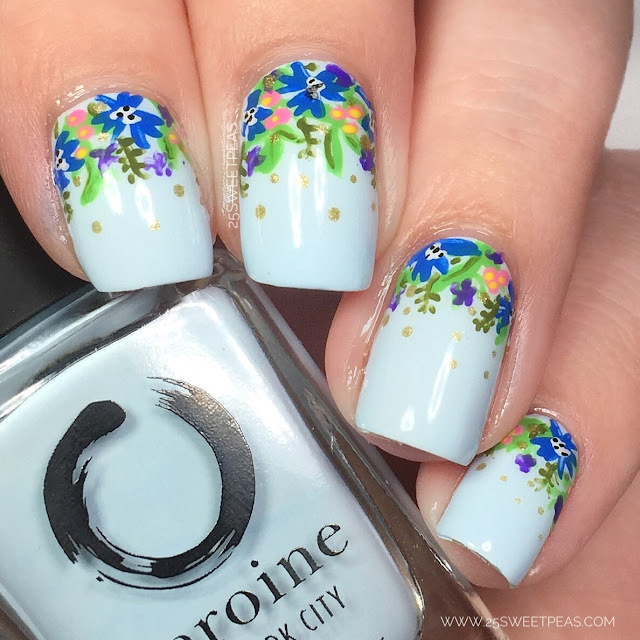 Absolutely stunning floral mani. Remover sounds interesting. I like that this remover has oils that it deposits onto your skin to help nurish it. But I'm not sure how well that would work in a swatching situation. I'd end up using regular remover to get the oil off my nails anyway.